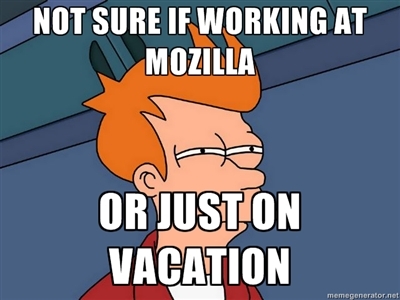 Today, I began my internship at Mozilla. I am not quite sure if today is representative of a normal day at the Mozilla offices. Because somehow I have ended up in a large hotel room to myself overlooking the beaches of Santa Cruz for a week. And I remember along the way, I was in some sort of limousine-school bus hybrid with neon-lighted alcohol racks and a flat-screen TV in the back. Oh, I also met the creators of django-debug-toolbar and jsFiddle. Uh, where am I? Woke up, brushed my teeth, put on some clothes, and walked to the office. Picked up my Thinkpad (i7 2.4GHz, 8Gb), went through some orientation. Got some free swag. Alright, standard. About to be introduced to everyone in the office and on the live stream as a new intern. Okay, not too bad. “Oh, by the way, get your ! @#$ together. Going to Santa Cruz for a week”. Wat. My first day was the start Webdev Offsite 2012 where all of the Mozilla webdevs from around the world get together to a disclosed location. It is like a conference. People give talks/keynotes, eat, drink, and also hack. I heard a story about someone’s first day being flying out to Las Vegas for a week for a previous Webdev Offsite. Didn’t know about this trip before I came in so it was surprising, in a good way. After I was introduced and helped myself to some Japanese catered lunch, I went to go edit my tax forms, but didn’t have my passport. If I didn’t have my passport, I wouldn’t be able to go since I had to have my passport within 3 days or else I get kicked out, and the trip was week-long. Fortunately, I had it shipped over and was due to arrive today. So I went back to the apartments, waited for the package, packed, played trivia on an IRC channel, and came back. Got that out of the way, good to go. I spent some time working on setting up my laptop while waiting for the bus to pick us up to go to Santa Cruz. Met a bit of people. As the time came, I picked up my bags, and boarded the bus. Well, this wasn’t no bus. It was like someone had built a limousine interior into a school bus. My school buses back in the day had chairs with gum under them. This one had neon-lighted alcoholic bars (with no drinks loaded, except for Diet 7up and Coors Light), a flat-screen TV in the back, and some bass-heavy music. I think Xzibit did some work on this bus. Spent the bus ride talking with some webdevs and playing with my camera. Finally, we arrive at the beach and hotel. We check into our rooms, and I find I have two queen-sized beds to myself. Though what catches my attention more is the glass door leading to the balcony overlooking the sandy beaches and rolling waves. Afterwards, we went out to eat and drink with tabs covered. I sat and talked with several webdevs, asked a bit of questions, had some beer and fries, and even talked to the creator of JSFiddle. I was pretty star-struck along with hearing James Bennett was around. Most people got pretty drunk. It takes too much work for me to get drunk, would take about 5 drinks which would bloat me up. Hour from midnight, I headed back and worked on setting up my laptop some more.